Mankind and horses go way, way back. Horses were first domesticated around 3500 B.C.E. somewhere in central Asia, near modern-day Ukraine and Kazakhstan. There are people who really, truly feel a distinct love and connection with these majestic animals. It's the kind of fascination that you can't really understand until you get up close to one in person. That's when the size, power, and nobility of horses truly becomes apparent. Horses aren't just beautiful, though. They're also highly intelligent and social animals who are just as capable of forming lasting emotional bonds with humans as we are with them. When the bond between man and horse is that strong, accomplished riders can do some truly remarkable things. 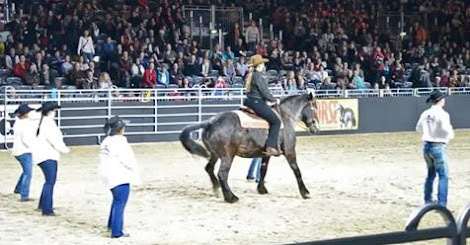 Country music star Billy Ray Cyrus posted the following video to his Facebook, showing a gray mare and her trainer at a rodeo. When Cyrus' classic single "Achy Breaky Heart" starts playing, the horse starts dancing in perfect sync with a group of line dancers. Her footwork is impeccable - she's certainly a better dancer than I am - and she doesn't miss a beat. Clearly, she and her trainer have a very strong connection for her to be so responsive to the trainer's commands. I can only imagine the time that must have gone into this performance. Remember to SHARE this four-legged Fred Astaire with your family and friends.